Michigan-based Spring Arbor University has seen enrollments increase since it started offering to the loan repayment program. A small but growing group of colleges are guaranteeing students that they will help them pay their student loan bills until they secure a well-paying job. Known as a loan repayment assistance program, the colleges offer to pay undergraduate student's loan bills until they earn enough to afford the payments themselves. Law schools have been offering these programs for decades as a way to encourage young attorneys to pursue lower-paid public service jobs. And in 2008, Tufts University began offering repayment assistance to all graduates working in public service. Now dozens of private colleges have similar plans in place, and they too are offering the assistance to undergraduates in all fields of study. The schools offer the pledge through the LRAP Foundation, which was founded in 2008 by Peter Samuelson, who used Yale Law School's repayment program while doing human rights work in China. "It really made a difference in what I could do after graduation," Samuelson said. Acting like an insurer, the foundation charges schools an annual fee for each student enrolled in the program. In return, it provides financial assistance for graduates who fall below certain income thresholds, which are based on salaries of recent graduates and other regional factors. Assistance is determined on a sliding scale. 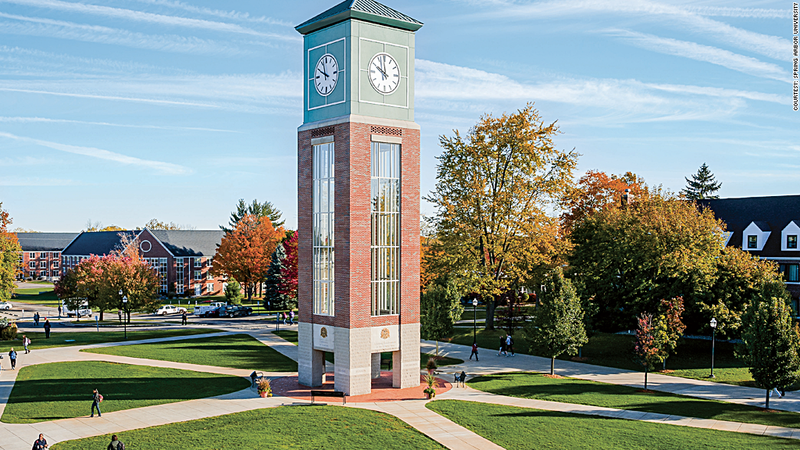 Under Houghton College's agreement with the LRAP Foundation, for example, graduates earning less than $38,000 a year post-graduation will receive some assistance, while those earning $20,000 or less will have 100% of their bills paid until their salary increases. The foundation will cover half of the student loan bills for someone earning $29,000 a year. Samuelson wouldn't disclose exactly how many schools have signed on to the LRAP program, but said the number increased by 50% last fall and includes dozens of colleges. CNNMoney found eight small, private Christian colleges offering the program, either currently or for students starting next fall. Each of the schools have no more than a few thousand students and cost between $30,000 and $40,000 a year in tuition, fees and room and board. "People right now are nervous," said Eric Currie, vice president for enrollment management at Houghton College, which is in Western New York "This is about giving confidence." Still, there are some caveats: Participants must graduate and work at least 30 hours a week to receive assistance. Plus, once a graduate breaks though the income threshold, he can no longer receive assistance -- even if his income falls in future years. And the loan assistance payments would likely be considered taxable income, meaning the graduate could be hit with a tax bill, said Mark Kantrowitz, a financial aid expert and publisher at Edvisors.com. Still, Kantrowitz said that the program reflects the kind of innovative approaches schools are adopting to address mounting student debt. Schools say the program is working, with noticeable boosts in enrollment and positive feedback from both prospective and current students and their families. In a recent survey of incoming freshman at Huntington University in Huntington, Ind., nearly 75% said that the LRAP program had influenced their decision to attend. Michigan-based Spring Arbor University, which costs close to $32,000 a year, including room and board, said enrollment among accepted applicants increased significantly last fall after it began offering the LRAP program. First-year college student Kelsey Hunt, who applied exclusively to Spring Arbor after learning of the program, estimates that she will take out more than $60,000 in federal student loans by the time she graduates. An aspiring graphic designer, Hunt's not sure what her career and income prospects will be when she enters the workforce. But she says the repayment program gives her confidence to pursue a field of study she is passionate about. "I want to stay optimistic, but I am probably not going to be making a ton of money, especially starting out," she said. "So it's very nice to be able to have this to help get me through."